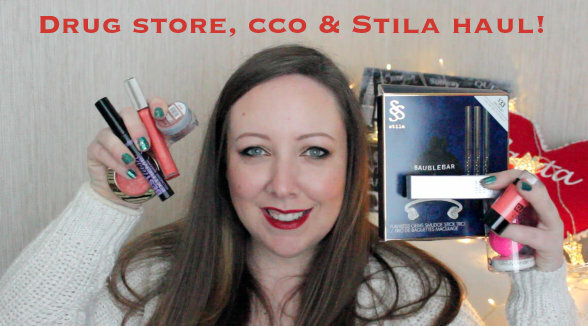 New York drug store, CCO & Stila haul! Part two of my New York beauty shopping is ready for your viewing pleasure! Again, Orla was highly influential in terms of my purchases and I think I was very restrained in the grand scheme of things. I like to pretend it was restraint, but really, I spent lots of money in Kate Spade instead! So have a look at the makeup I bought everywhere except Sephora. You can click here to watch the Sephora haul and I've been making my way through the things I've bought over the last couple of weeks, so in the new year, I'll be able to review them all properly for you. I realised that I didn't buy any skincare products at all and I think it's because my skincare routine is pretty perfect right now and you can read all about that here if you're on the hunt for new products for your visage. But makeup. I love it, I bought it, I can't wait to pile it all on my face. Watch me waffle on like a good thing in my video! Quick and easy New Year's Eve makeup look! My 2015 New Year's Resolutions! My favourite videos from Lovely Girlie Bits 2014! My top picks from the Space NK sale! Merry Christmas from Lovely Girlie Bits! Christmas Stocking Stuffer Gift Guide!